A long line of rough Great Wall in the mountains of Zhangjiakou's Huailai County. 6–7 hours start to finish over 17km. This hike is definitely not suitable for those who are not physically fit, are afraid of heights, or lack proper clothing and footwear, and we’re going to ask you some questions about your hiking experience as part of the reservation for this hike. This is one of our favourite long hikes – a long trek that is as challenging as it is rewarding! 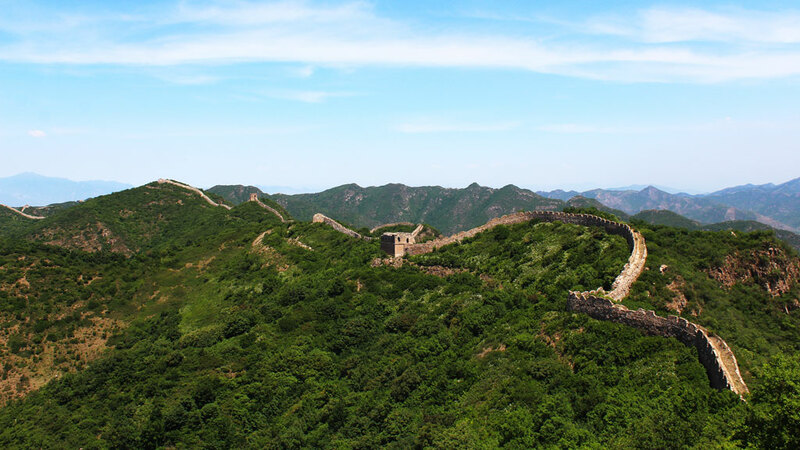 On this route, we’ll get to enjoy a tough walk, incredible scenery, and a wild stretch of the Great Wall of China that is seldom visited. 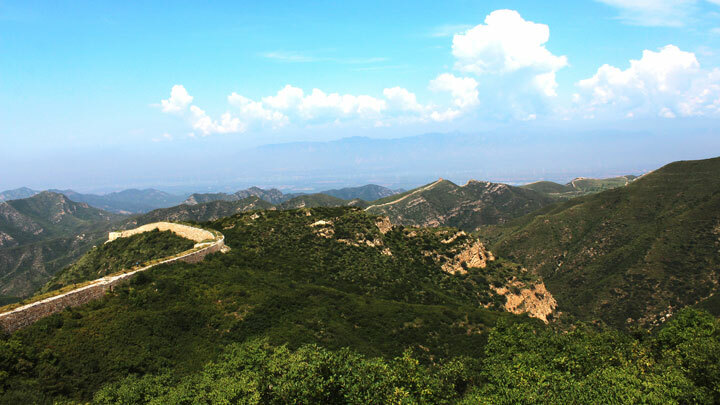 We’ll start the day with a drive into Hebei Province that takes along a winding mountain road with some very impressive vistas of the surrounding valleys and peaks. 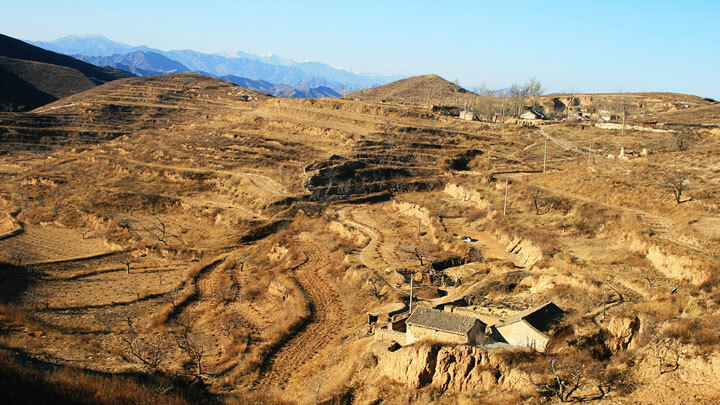 The hike begins with a westward stroll up a broad valley along a dirt road crossing farmer’s terraces. To the south, we’ll have great views of imposing saw-toothed crags soaring towards the clouds. 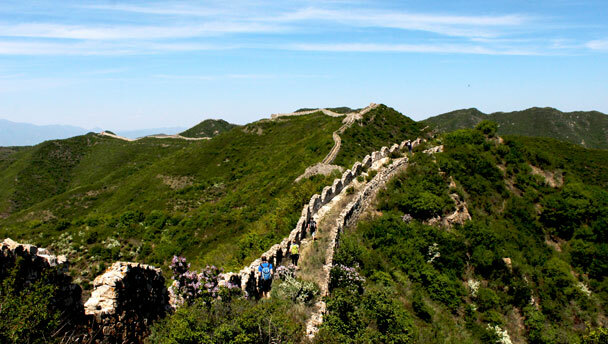 This stretch leading to the Great Wall is not too steep, but it is a nonstop uphill walk. Bushes and small branches impinge onto the trail at some points, but for the most part it is clear walking. It begins to get a little steep as we reach the crest of the ridge upon which the Wall sits, but we won’t have to scramble over anything too difficult. There are hardly any level stretches along the section of the Great Wall that we’ll be hiking. Although the difference between the highest and starting elevations is around about 700 meters, we’ll actually end up climbing much more than that as the Wall rises and descends along the rolling ridgeline. Some of the uphill bits are very steep and will require us to use our hands to pull ourselves up. Also, there are a few downhill parts that we’ll have to take at a very deliberate pace, as they are slippery and also steep. 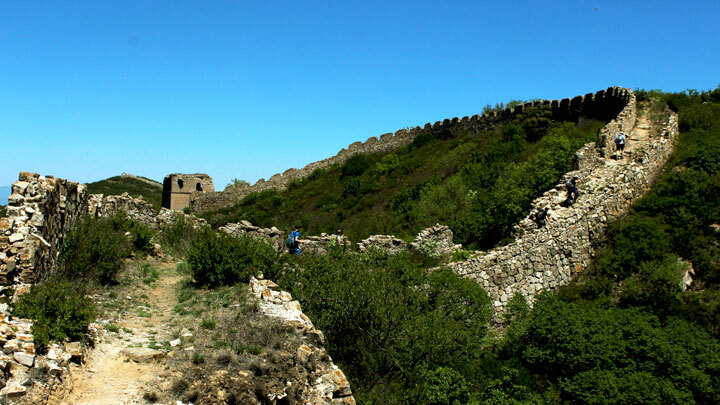 Some parts of the Great Wall we’ll bypass altogether as they are now too dilapidated to safely and sustainably traverse. 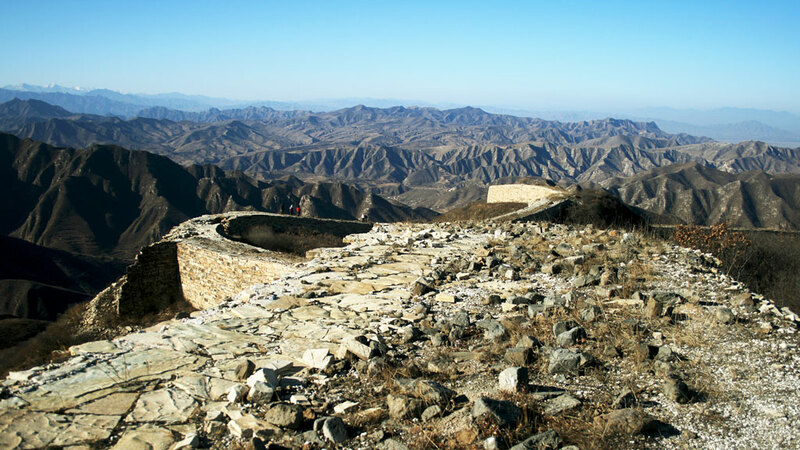 We will hike along the Great Wall from Zhenbiancheng until we reach Big Camp Plate, which may already be familiar to some hikers. 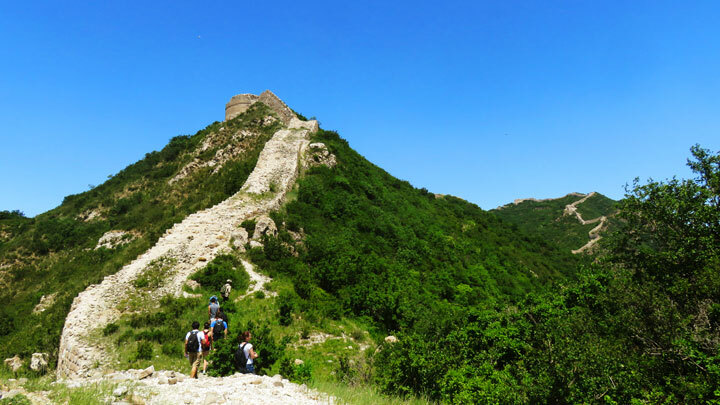 Once we leave the Great Wall, we’ll still have a little over an hour left of hiking. We’ll cross over fields along a trail that terminates at a concrete road. We will follow it down to the highway and meet our bus there. There are some steep climbs on loose footing while on the wall. We need to keep moving at a fairly steady pace to complete the hike on time. Level 5+ hikes are the most difficult hikes we do: long, with tough ascents and descents.They are physically challenging, and suitable for experienced hikers in good shape. Photos and reports from previous hikes and visits. 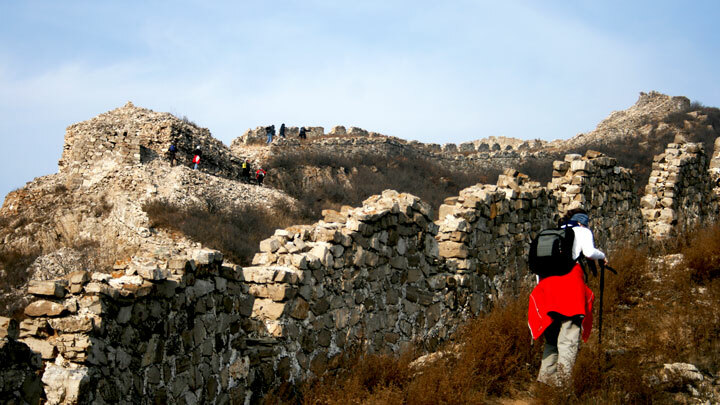 Rain threatened on this hike along the rough Great Wall in Beijing's northwest—see a set of 19 photos from the Zhenbiancheng Great Wall and Big Camp Plate Challenge. 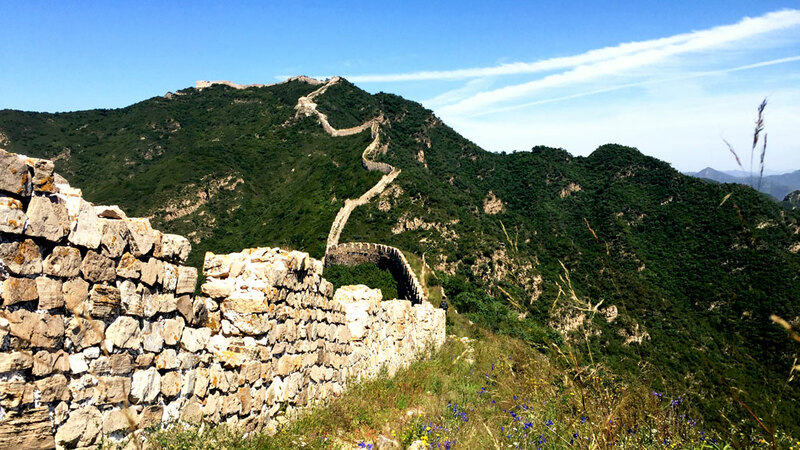 Twenty-seven photos from one of our favourite long hikes, the Zhenbiancheng and Big Camp Plate Great Wall Challenge. 35 photos from a long and tough hike through the mountains of Beijing’s northwest. 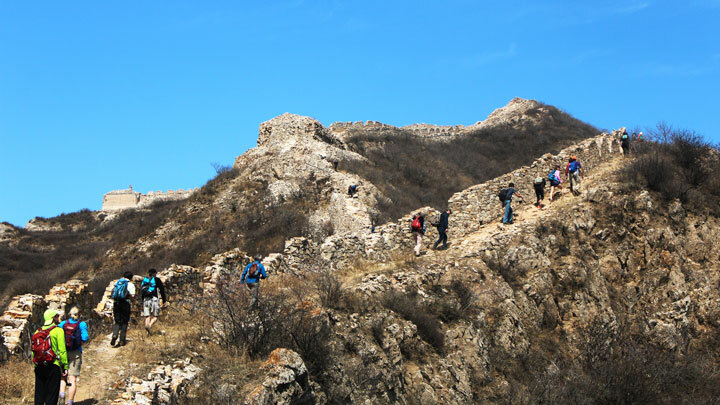 See some photos from a long hike along unrestored Great Wall in Yanqing County. Of the 18.5 kilometers we hiked, it seemed like we might have been walking on flat ground for just 1km in total. 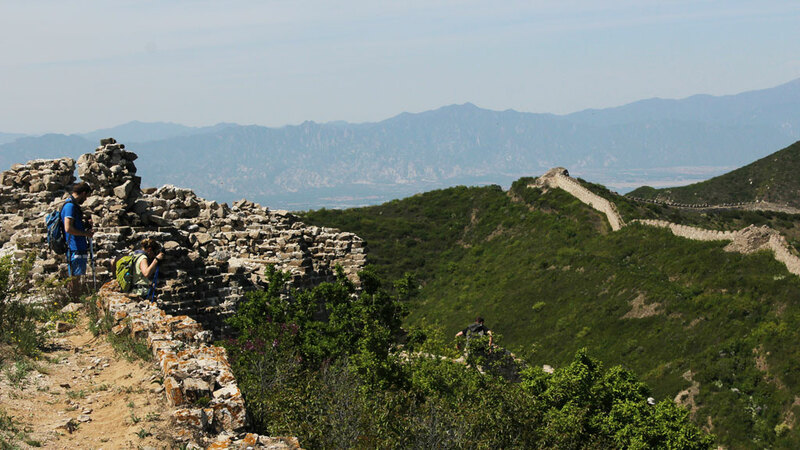 Despite a thick haze as we left the urban area of Beijing, we had breathtaking views of Hebei and the western border of Yanqing County as we tramped for seven and a half hours on the Zhenbiancheng section of the Great Wall. Click through for photos, a write-up, and statistics from the hike.